Status: offline 42 year old male was mountain biking on rough terrain. He hit a rock and was flipped over the handle bars landing on the right shoulder. He has global shoulder pain and swelling. Status: offline Ouch!!! Definitely something going on here. My first contact was the coracoid process. Looks like something going on there. Doesn't the proximal end of the clavicle articulate with the manubrium, which is by the first rib? It looks way too low. The distal clavicle seems to be separated from the acromion. The humerous looks depressed from the glenoid fossa. Something looks like a fracture on the humerus but the line also goes out laterally from the first view into the film. I don't know if that is some kind of artifact or a line in the film itself. Lots of swelling as well. 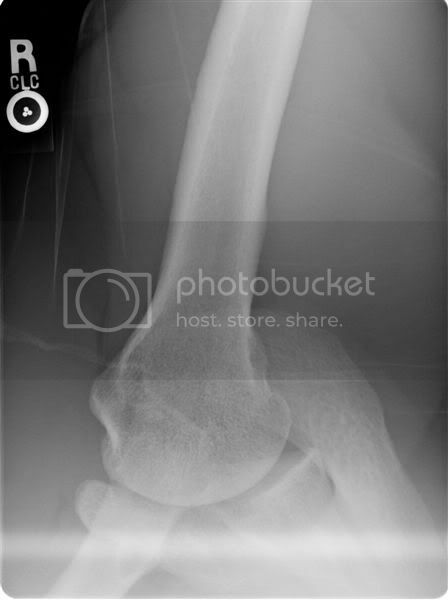 Status: offline Greater tuberosity avulsion fx? from the first film. Whats wrong with the second rib visible on both the first and second films? Or, am I seeing the transverse process at this level? Status: offline Yes, the second rib looks like a top piece has come off it. An avulsion fracture? It certainly looks that way. Status: offline Something with the greater tuberosity. Did the proximal end of the clavicle get disconnected and fractured too? Why is there a really bright diagnal line from the glenoid fossa to the scapula? Status: offline Is the scapula fractured? Looks like the coracoid process is not in the right area. Also looks like there's fx of the greater tuberosity...What view is the last film? Status: offline The first two films were taken standing(evidenced by the marker) which typically involves the patient holding weights in their hands. This helps to assess integrity of the AC joint and capsule. However, I was taught to take #1(Standing AP neutral) visualizing both shoulders. This enables assessment of not only the integrity AC joint of the shoulder in question, but also to assess horizontally, the clavicle heights bilaterally. With AC tears, the distal end of the clavicle will usually rise. #3 is recumbant-lateral. The border along the glenoid labrum looks suspicious, as does the border at the surgical neck. Status: offline Wow. Good case. 2. I wonder if this is a projection/positioning error, as the SC joint cannot be well visualized, and it appears as if the shoulder is much more inferior on the thorax than it should be anatomically. ?SC dislocation? 4. Third view is the axillary and rules out a dislocation, though the humerus is sitting quite anterior in the glenoid. If this was trauma, I wonder why the Y view was not done? 5. Greater tuberosity - looks a bit too rounded to be acute - old avulsion? 6. There appears to be a congenital variant to the scapula "the bright line", though it does not seem to involve the coracoid. With only one view of it, it's really hard to say for sure what it is. Would love to see what the radiologists say about this one, I definitely am not sure of what to make of it! Status: offline >>>if the shoulder is much more inferior on the thorax than it should be anatomically. ?SC dislocation? This is due to the weights the patient is holding in his hands. Status: offline The ribs and clavicle look normal to me. What has been referred to as a fracture of the 2nd rib is on the third rib, I think. I think you may be talking about the costo-transverse articulation of the third rib on T3. The AC joint looks normal. The coracoid loks normal. We can't see any of the cervical spine so we can't comment about cervical ribs. There is a fracture of the anterior glenoid rim and I suspect a fracture of the neck of the glenoid, agreeing with Jeep's last comment. I think he needs a CT scan to confirm. How did I do? If these are indeed weighted ACJ films, they are neither performed nor marked properly. A weighted ACJ film would be an AP of BOTH shoulders/ACJs which would include both SCJs, and be marked "W/Weights" with the proper marker. Even with weights, it would not explain the relative appearance of the clavicle to the thorax, which is why I suspect a projection error. Status: offline Actually.. was that mountain biker wearing a helmet? Could you imagine if not and taking the landing on the head?? All I can say is that an X-ray wouldn't show the mush! I was wondering one of the things Jeep pointed out - where's the other shoulder? I'm better at doing that quick thing first of comparing involved to uninvolved. As to the proper marking- See the three little "dots" within the circle? The "dots" are at the bottom of the circle on the first two films, and in the center of the circle on the third film. A very simple yet efficient means of, while using the same marker, to indicate exactly this information(standing vs recumbant). Also- these are not ACJ films, they are considered shoulder films. The weights just help to give more information specific to ACJ integrity. Status: offline Actually the films are not with weights in the hand. Obviously Jeep works with xray equipment because not very many know about these markers. He is correct the first two films above are with the patient standing and the last is with him laying down. The way you know is by the markers. This is a picture of the marker standing up against my stapler on my desk. Gravity causes the three lead beads to fall to the bottom of the round glass. This would be placed on the film in the vertical position with the patient standing up. This picture is with the marker laying flat on my desk. The three lead beads then migrate to the center of the round glass. This lets you know the patient was laying down when the film was taken, the film was laying flat on the table with the patient on top of it. Compare the position of the lead beads (dots) in each of the films above. The "SA" is our radiology tech's initials so we know who performed the exam. If weights had been used, our protocol is to place "WW" along with the marker, meaning "With Weights". Good points Jeep. The patient was standing up because it hurt too much to lay down. Also, in the axillary view the vertical stripe across the humerus (around the surgical neck) is actually a seam on the guys mountain biking shirt. Because of the acute pain they did not take it off and so the artifact is evident. Status: offline Good discussion Alex. Standing "DOES NOT" equal weights in the hands, important point for looking at shoulder films. Status: offline It looks like there is incidental calcium deposition witin the supraspinatus tendon at the greater tuberosity. Status: offline I am with Jason on this one - possibly HOH dislocation and something not right with the ACJ..
seems to be consistent with standing and lying views. Status: offline Thanks for the info Alex. I would like to know if there are other markers, besides the left and right markers, that we should know about for future reference. This was not taught in my radiology class!! It should have been included. Status: offline Your are correct in that a standing film does not mandate weights. Usual protocol, in my experience, is that standard shoulder films are taken recumbent, and the reason for standing is to add the weights(something can not be done while recumbent). This gives additional information regarding Soft tissue integrity, along with the standard, fracture, dislocation, pathology info. As Alex said, the films were taken standing because it was too painful lay down. I have ordered many "atypical" films due to unusual circumstances of a particular patient. I agree with you on the inferior rib slope, again something commonly seen in weighted films Since Alex has told #1 and #2 are not weighted, my first impression would be a pain posture. Status: offline Whoa....nice SC jt. dislocation with calcific tendonitis of the supraspinatus! Did he have prior shoulder problems...possibly impingement d/t the calcific deposits? 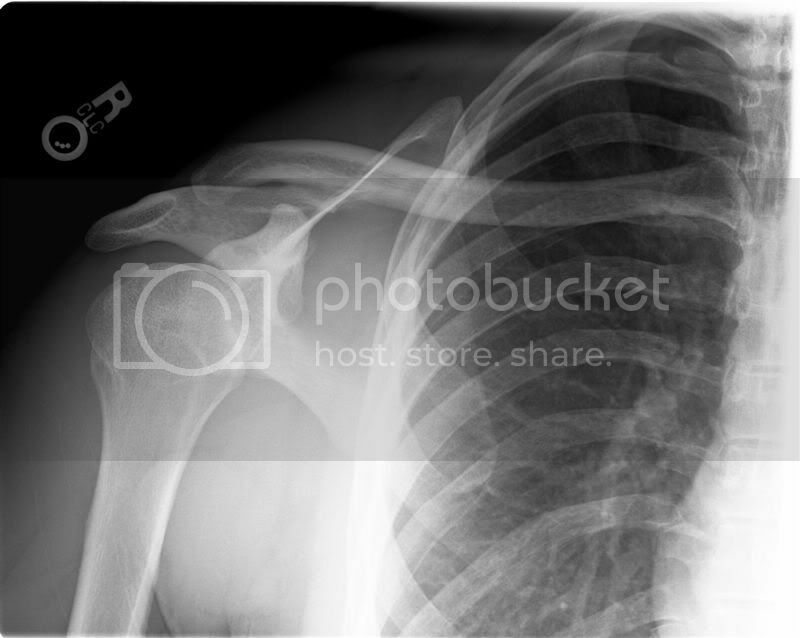 I may be convinced that the distal inferior cortex of the clavicle shows a small fracture....but my screen is too small to tell.